Our ideas about genius, madness, and the existence of a close relationship between them are modern inventions. For millennia people explained the world about them—especially creative/good and destructive/bad behaviors—in spiritual or god terms. In the biblical view, creativity is the prerogative of a single supreme Creator. The Scripture attributes the miracle of life to a specific divine act: “And the Lord God formed man of the dust of the ground, and breathed into his nostrils the breath of life; and man became living soul” (Genesis, 2:7). Hence comes our notion of inspiration as an explanation for great works of art and science. The idea of inspiration—of breath, soul, or some other mysterious “substance” entering the person from without and enabling him to perform exceptionally good or bad deeds—has never lost its influence on Western thought. It is the source of the notion of possession (by spirits), and its modern successors, “possession” by the creative inspiration of genius and by the destructive irresistible impulse of madness. We replace spirit–god words with body-mind words and exult in our smug conviction that we are explaining exceptionally good and bad behaviors scientifically. The original sense ‘tutelary spirit attendant on a person’ gave rise to a sense of the same meaning ‘a person’s characteristic disposition’ (late 16th century), which led to a sense ‘a person’s natural ability,’ and finally ‘exceptional natural ability’ (mid 17th century). genius (n.) late 14c., “tutelary or moral spirit” who guides and governs an individual through life, from Latin genius “guardian deity or spirit which watches over each person from birth; spirit, incarnation; wit, talent;” also “prophetic skill; the male spirit of a gens,” originally “generative power” (or “inborn nature”), from PIE *gen(e)-yo-, from root *gene– “give birth, beget,” with derivatives referring to procreation and familial and tribal groups. Sense of “characteristic disposition” of a person is from 1580s. Meaning “person of natural intelligence or talent” and that of “exalted natural mental ability” are first recorded 1640s. genie (n.) 1650s, “tutelary spirit,” from French génie, from Latin genius (see genius); used in French translation of “Arabian Nights” to render Arabic jinni, singular of jinn, which it accidentally resembled, and attested in English with this sense from 1748. The stubbornness hardwired into us preventing successful adapting to cope with changes is perhaps the true seat of our “intelligence.” There is growing evidence to suggest the concept of “free will” is an illusion and we are in fact driven by the desires of a subconscious, inner version of ourselves. This is why we so often do the things we “know” we ought not to do, and procrastinate with the things we “know” need to happen to achieve our clear goals. A theory put forward by the late Benjamin Libet, a renowned pioneer of human consciousness research, suggests the persona we associate as our “self” is not the one leading the way. Rather, we are an executive of sorts, with limited direct control over how we react to change. Libet’s ideas resulted in the concept of “free won’t“: we have the power to veto the courses of action taken by our subconscious, but are otherwise at the mercy of our nature. Think of it this way: intelligence is that thing inside of us making all the decisions we mostly go along with; meanwhile, genius is the ability to know when these automatic choices are worth adjusting or switching up entirely. With all this in mind, a better understanding of “genius” starts to emerge… genius can be seen as the ability to break free from the predestined, comfortable route when all signs point to the need to change. It’s the absorption of observations without precedent or plans. It’s drawing conclusions and taking a new course of action to outmaneuver the inevitable drawbacks of staying on the same course. Everyone and everything alive today is a product of past genius and thus carries the potential for genius going forward. I’m happy, I’m healthy, I’m hyperthymic. Several temperament and personality traits are related to bipolar disorder, to creativity in individuals with bipolar disorder, and to creativity in healthy individuals, seemingly occupying the space between madness and genius. Both bipolar and creative individuals have higher cyclothymic, dysthymic, and irritable temperament scores compared with noncreative controls [36, 38, 50– 52]. 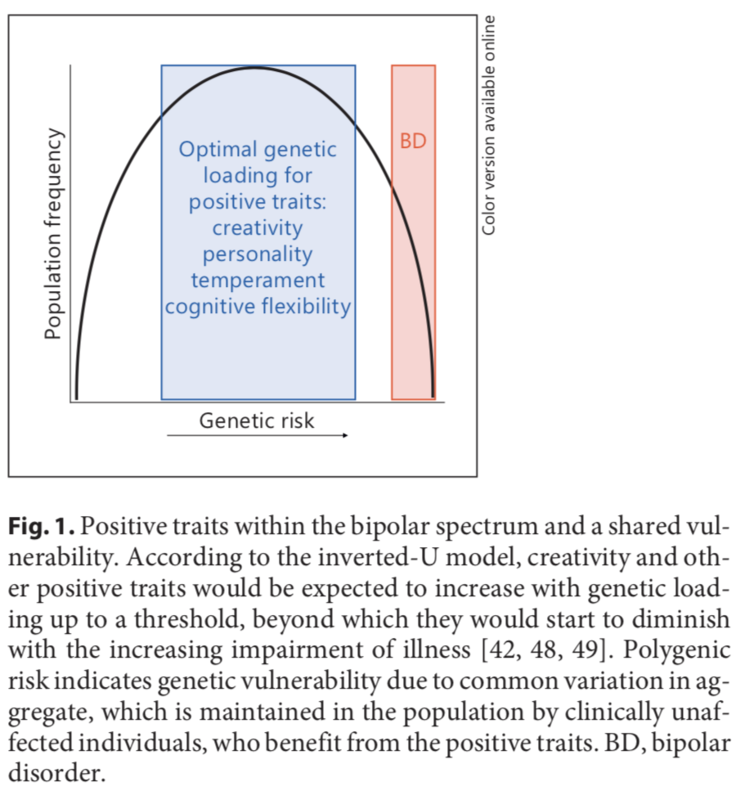 Hyperthymic temperament is further associated with creativity in healthy subjects, as are hypomanic personality traits, which predict risk for bipolar disorder [53–55]. Bipolar and creative individuals also have higher neuroticism, extraversion, and openness personality scores compared with noncreative controls [33, 36–38, 51, 52, 56–61]. Openness to experience is a central feature of creativity, with an estimated effect size of 0.71 [33, 62–66]. Openness is also heritable in bipolar families . Although the exact nature of the relationship is unclear, intelligence and cognitive style are associated with aspects of creativity . Creative people tend toward divergent thinking, the cognitive ability of associational network activation and creative ideation, and an over inclusive cognitive style, which involves remote associations and may facilitate originality . The hallmark symptoms of mania include increased word production and loose associations, and, not surprisingly, manic bipolar patients exhibit conceptual over inclusiveness, similar to creative writers . Such loose associations may result from a failure to filter irrelevant stimuli from the environment, a process known as cognitive disinhibition , which has been associated with both psychosis proneness  and creativity . While intelligence, particularly executive function, may be associated with performance measures of creativity, like divergent thinking [72–74], this effect appears only moderate (d = 0.31) . In fact, above-average intelligence (IQ >120) appears to be necessary but not sufficient for high creativity , and once this threshold is met, personality factors like openness are more predictive of creative potential . Still, higher executive function has been shown to mediate increased creativity during mania . The combination of high IQ and cognitive disinhibition may also predict creative achievement . Finally, a positive mood appears to provide a significant cognitive advantage in the performance of divergent thinking tasks, whereas a negative mood inhibits this process . Recent studies have made significant progress in defining the relationship between bipolar disorder and creativity. In one study of bipolar families, a network analysis of the observed phenotypic correlations revealed clusters of traits related to affective temperament, impulsivity, risk taking, and psychosis proneness (a “bipolar spectrum” component) and to executive function, processing speed, working memory, and long-term memory (a cognitive component) . Interestingly, perceptual creativity was found to span these clusters. 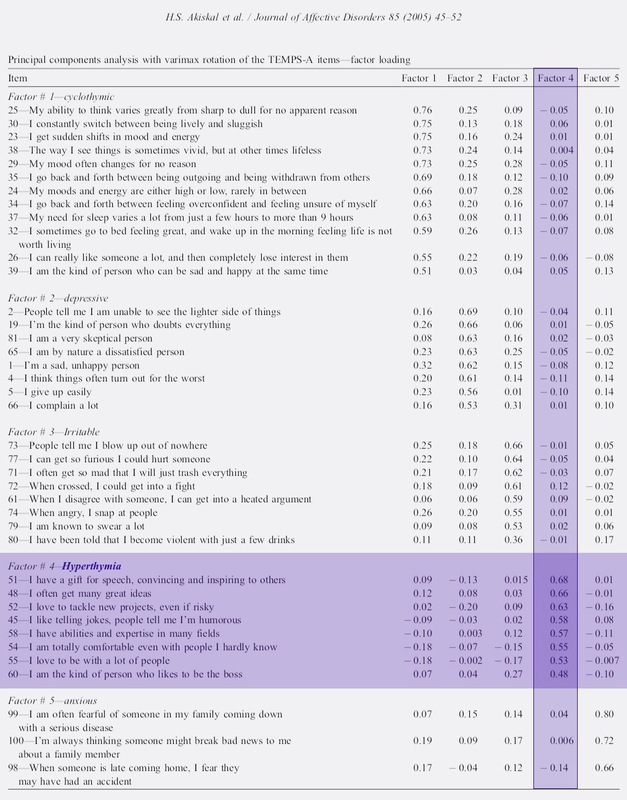 Another study examining individuals with bipolar disorder and their healthy co-twins found increased sharing of positive traits related to temperament, schizotypy, impulsivity, and sensation seeking that were further correlated with increased verbal learning and fluency in the co-twins . These studies highlight the need to examine multiple dimensions of personality, mood, and cognition to fully understand concepts relating to positive traits within the context of creativity and illness. Creativity thus appears to result from the complex interaction of multiple personality, cognitive, and affective traits [69, 81, 82], which may reflect a shared vulnerability with bipolar disorder [49, 83, 84]. A summary of the components that likely occupy the space between madness and genius is presented in Figure 2. However, the mechanisms by which these traits mediate creativity are unknown, and it is unclear as to whether they explain the association of creativity with bipolar disorder. Dr Nassir Ghaemi, a professor of psychiatry at Harvard Medical School who holds degrees in history, philosophy and public health, has a different view of the role that mental illness can take in determining the behaviours of world leaders. His somewhat radical thesis, put forth in his book A First Rate Madness, proposes that in times of peace, mentally healthy leaders perform well — but in times of crisis, mental illness can actually be an asset for a leader. Dr Ghaemi sees three mental abnormalities cropping up in a host of revered leaders:, hyperthymia, cyclothymia, and dysthymia; or their more severe forms; mania, bipolar, and severe depression. He charts the presence of mental illness in historical figures by looking at symptoms, genetics, treatment, and the course taken by the illness. Churchill, Abraham Lincoln, Mahatma Ghandi, and Martin Luther King Jr., he says, were depressed, General William T. Sherman, media mogel Ted Turner, John F. Kennedy, and Hitler all experienced varying degrees of mania or bipolar states. Linking genius with madness is an idea that Aristotle speculated about 2,500 years ago. At the height of the nineteenth century Romantic era, Italian psychiatrist Cesare Lombroso went so far as to assert that genius and insanity were inseparable. For Dr Ghaemi, desperate times call for desperate leaders. He draws attention to four key elements of mental illnesses which can, he says, accentuate leadership during crises: realism, resilience, empathy and creativity. Depression, he suggests, brings out all four of these qualities, while creativity and resilience can be found in manic illness. Akiskal, Hagop S. “Dysthymia, Cyclothymia, and Hyperthymia.” New Oxford Textbook of Psychiatry, 2012, pp. 681–692., doi:10.1093/med/9780199696758.003.0091. Akiskal, Hagop S., et al. “TEMPS-A: Validation of a Short Version of a Self-Rated Instrument Designed to Measure Variations in Temperament.” Journal of Affective Disorders, vol. 85, no. 1-2, 2005, pp. 45–52., doi:10.1016/j.jad.2003.10.012. Altucher, James. “How To Be A Genius.” The Huffington Post, TheHuffingtonPost.com, 18 Jan. 2017, www.huffingtonpost.com/entry/how-to-be-a-genius_us_587e990ee4b0474ad4874e81. Doran, Christopher M. The Hypomania Handbook: the Challenge of Elevated Mood. Wolters Kluwer Health/Lippincott Williams & Wilkins, 2008. Goodwin, Donald W. “Creative Brainstorms: The Relationship Between Madness and Genius.” JAMA: The Journal of the American Medical Association, vol. 270, no. 15, 1993, p. 1870., doi:10.1001/jama.1993.03510150106045. Greenwood, Tiffany A. “Positive Traits in the Bipolar Spectrum: The Space between Madness and Genius.” Molecular Neuropsychiatry, vol. 2, no. 4, 2016, pp. 198–212., doi:10.1159/000452416. Guimón, José. “Positive Bias: The Myth of the ‘Crazy Genius.’” Inequity and Madness, 2001, pp. 21–33., doi:10.1007/978-1-4615-0673-7_3. Heymont, George. “The Genius Factor.” The Huffington Post, TheHuffingtonPost.com, 21 June 2017, www.huffingtonpost.com/entry/the-genius-factor_us_59446358e4b0940f84fe2e79. Laurinavicius, Tomas. “Adaptability: The True Mark Of Genius.” The Huffington Post, TheHuffingtonPost.com, 7 Dec. 2017, www.huffingtonpost.com/tomas-laurinavicius/adaptability-the-true-mar_b_11543680.html. Levenson, Edgar A. “Creativity, Genius, and Divine Madness 1.” Interpersonal Psychoanalysis and the Enigma of Consciousness, pp. 269–276., doi:10.4324/9781315532417-21. Neyrey, Jerome H. “‘I Said: You Are Gods’: Psalm 82:6 and John 10.” Journal of Biblical Literature, vol. 108, no. 4, 1989, p. 647., doi:10.2307/3267185. Robinson, Andrew. “5. Genius and Madness.” Genius, Jan. 2011, pp. 54–69., doi:10.1093/actrade/9780199594405.003.0005. “The Space between Contradictions.” Nola, pp. 308–314., doi:10.2307/j.ctt20q1vsq.35. Truzzi, Marcello, and George Becker. “The Mad Genius Controversy: A Study in the Sociology of Deviance.” Social Forces, vol. 58, no. 2, 1979, p. 692., doi:10.2307/2577616. Whitehead, James. “Creativity, Genius, and Madness.” Oxford Scholarship Online, 2017, doi:10.1093/oso/9780198733706.003.0006. “Genius | Search Online Etymology Dictionary.” Index, www.etymonline.com/search?q=genius. 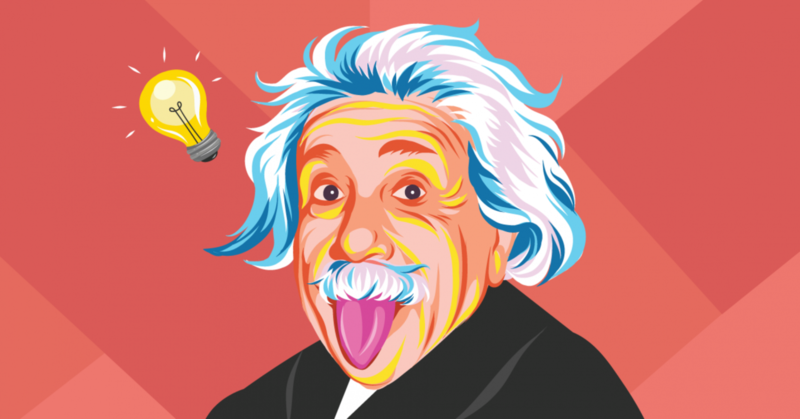 Einstein graphic from the “How to Be a Genius” by James Altucher via Huffington Post.